I’ve always been fascinated with the idea of translating digital ideas into physical reality. The idea of taking a set of data, either made up or recorded from somewhere and representing that in a digital way. 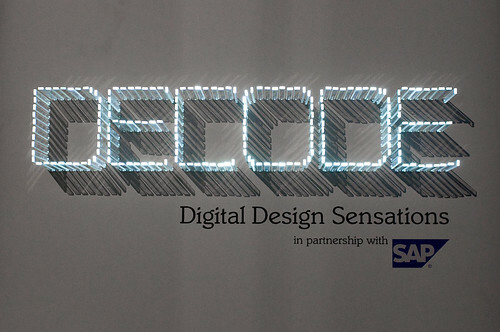 The Decode: Digital Design Sensations exhibition at the V&A is a demonstration of just that. Digital ideas represented in an easy to understand way. 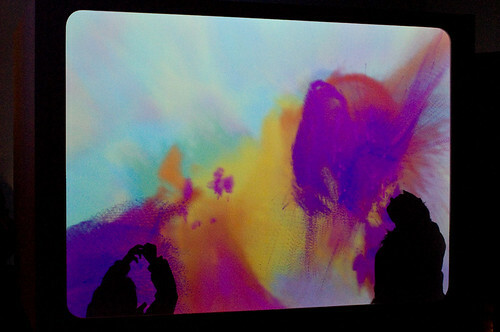 The exhibition was split into three distinct parts: Code, Network and Interactivity. 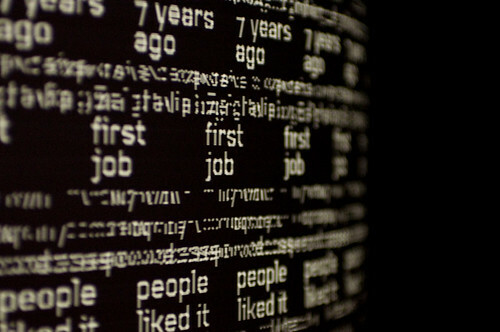 Code simply showed what could be done with raw data and the different ways in which it can be represented. I particularly liked the Digital Zoetrope by Troika London in this section which comprised text spinning on the outside of a cylindrical object, and appeared to slow down periodically in order to reveal certain facts. Network contained exhibitions which displayed information which used a network in order to supply the information. There were a number of different ideas present here which mainly seemed to aggregate data and provide a visual representation of the data. One of the possibly more well known exhibits is the Exquisite Clock, where users who have downloaded the iPhone app can contribute an image to the clock pool. The clock uses these contributed images to display the time. The interactivity section was by far the largest, in space and numbers. Rafael Lozano-Hemmer’s Make Out display was one of the most intriguing with a six screen display with lots of videos of people kissing, sourced from the internet. 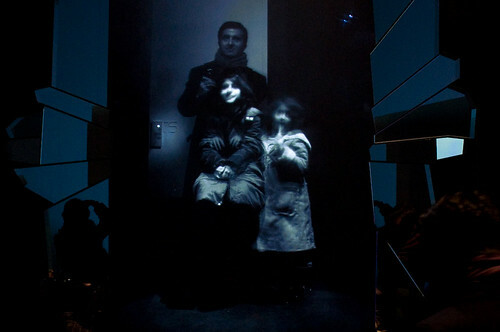 Other installations which I really liked included the Vanetian Mirror by Fabrica, which essentially recorded a long exposure picture but in a digital form. It was displayed on a high definition screen, almost life size. Because of the long exposure, subjects would have to sit or stand still for a few minutes before being completely and clearly shown. Daniel Rozin’s Weave Mirror was also extrememly clever using motors, electronics and laminated c-shaped prints to display a reflection of whatever was in front of the mirror. The mirror was constantly moving to reflect what it saw using a gradient from light to dark. Alth0ugh not by any means the last of the exhibition, Body Paint by Mehmet Akten seemed to be one of the most enjoyable interactive exhibitions with people throwing themselves and everything else they had up, down and around in front of the display which altered the paint on the digtial canvas. A very neat idea, and very well made! 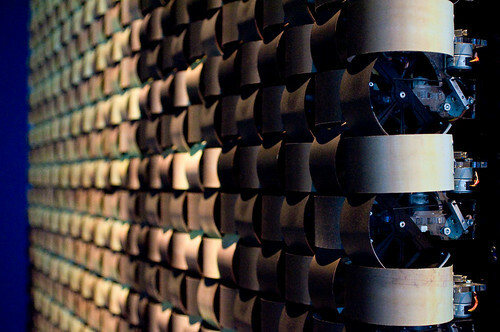 Overall, the exhibition really shows off current trends, capabilities and performance by digital designers around us. 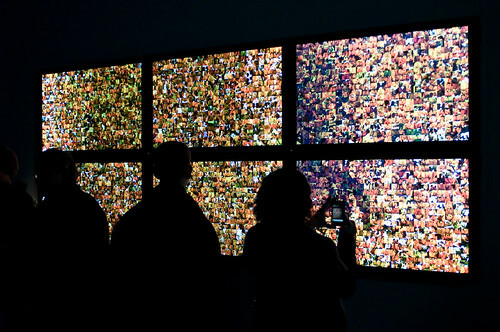 The multitude of ways data can be represented, used, manipulated and displayed are seemingly unlimited. This, it seems, is the future – digital ideas which transcend the virtual world and real world boundaries, and bring some of the human elements back into computers.